Yesterday, Boris Johnson and I launched a new pamphlet for the Policy Exchange think-tank, At A Rate of Knots, advocating a dramatic expansion of the Thames Clipper commuter riverboat service. I confess that, given the weather forecast, we had high hopes last night of a repeat of February's total snow shutdown - when Thames Clippers was more or less the only public transport in London that kept going, and certainly the only link between Greenwich and the rest of the world. What more demonstration of the river's usefulness could you ask? Looking at the fairly light snowfall in inner London yesterday, I thought we were destined to be disappointed; and certainly the main roads were clear, with buses, DLR and Tube running well. I reckoned without the unique and seismic hopelessness of Southeastern Trains. This ridiculous company decided on Tuesday night to axe two-thirds of its daytime service and its entire evening service, hours before so much as a flake of snow even fell. The daytime frequency was cut to half-hourly and the last train from London to Greenwich was at 7.47pm. It is doing exactly the same today, even though there has at the time of writing been no snow for eighteen hours and none is forecast until a very light shower at 3pm. Southeastern (in its earlier guise as Connex) is of course the company that cancelled trains because the sun was shining, memorably described by Connex announcers as "adverse weather conditions" (it got in the drivers' eyes, or warped the rails, or something.) But this performance over the snowfall, or in south-east London the snow-dust, is far worse. As far as I can tell from their websites, every single other London commuter operator - including those in areas of the capital with much heavier snowfall, such as South West Trains - is trying to operate a proper service today, though there will no doubt be cancellations. Southeastern isn't even trying, even though there's not actually that much snow in its part of London. The riverbus would have whisked me from the launch at the Shell Centre, Waterloo, to Greenwich in about 35 minutes - about the same time as the train, now you nearly always have to change at London Bridge (another Southeastern triumph.) They run every 20 minutes during the day, and every 30 minutes in the evenings, with the last one from Waterloo Pier at 12.15am - half an hour later than Southeastern, even on a normal day. That last boat, and the entire service, ran normally yesterday and is expecting to run normally today. If Southeastern stops bothering with us, it is time to stop bothering with them. If you travel every day between Greenwich and central London, the riverbus price is almost exactly the same as travelling by train. And it is about a million times nicer, with a guaranteed seat, even in the rush-hour, guaranteed no jams or points failures, an on-board coffee bar and a view of the world's greatest city unfolding before your eyes. Our pamphlet proposes that the service be jacked up to operate every ten minutes, and that there be a second, westerly route between central London and Putney - making the riverbus the equivalent, in passengers carried, of about half a new Underground line, in a tenth of the time and for about a thousandth of the cost. Look at our pamphlet and try the riverbus - here's the timetable. You have nothing to lose but your trains. The council's plan to pedestrianise part of Greenwich Town Centre, being consulted on now, is one of those things which looks, at first glance, worth having. But any close examination of the proposals shows them to be damaging, if not indeed unworkable. No-one, of course, can be happy with the present situation in the town centre - and the new proposal is not without merits. But on balance, what's proposed is appreciably worse than now. The suggested changes will only remove traffic from a relatively small part of the centre. But they will impose extra traffic on the rest of the centre - and across a far wider area. Most options proposed will also devastate Greenwich's bus service, hardly conducive to a car-free future. The only one which doesn't do this will, as the council admits, lead to extra congestion. The main beneficiaries, as the council explicitly states in its Greenwich Time advert, will be tourists ("the millions who will visit Greenwich in 2012, and in the years to come") and the businesses that serve them. The main victims will be local residents and non-tourist businesses. The consultation is in the very finest traditions of Greenwich Council - a loaded questionnaire; a short deadline for replies (15 January); a public exhibition lasting all of three days, tucked away in a room down a back corridor of a building accessed via a path leading off a side street; and no data to back up their claims. They say some of the pedestrianisation options would "reduce overall congestion and pollution," but the people at the exhibition admit that no modelling has in fact been done on how the proposals will affect traffic flows. If you do want to go, today is the last day of the exhibition and you have until 8pm. Or you can respond online. The easiest way to understand what's proposed is to look at the maps in the consultation booklet, downloadable here. But here's my summary of it. The plans would pedestrianise the College Approach and King William Walk parts of the one-way system. Traffic travelling east from Creek Road to Romney Road would go the other way round the town centre - that is, turning right into Greenwich Church Street then left into Nelson Road, which would become two-way. There are two options for what happens to traffic going west after it leaves Nelson Road. In option 1, it would turn right into Greenwich Church Street, which would also become two-way. This option would almost certainly lead to enormous traffic congestion at the junction by St Alfege Church and is thus, as one of the officers admitted to me at the exhibition, probably "unworkable." Option 2, which the council appears to prefer, is turning the whole of west Greenwich into a giant gyratory system. Greenwich High Road (between the town centre and the North Pole pub) would become one-way, westbound-only. The whole of Norman Road would become one-way, northbound-only. Creek Road (between the top of Norman Road and the town centre) would become one-way, eastbound-only. Under this option, westbound traffic from Romney Road/ Nelson Road to Creek Road would use Greenwich High Road as far as the North Pole, then turn right into Norman Road, then left into Creek Road. No traffic would be able to approach Greenwich on Greenwich High Road. Everyone coming from Greenwich South Street, or the lower reaches of Greenwich High Road, would have to go all the way round via Norman Road and Creek Road. All this, it seems to me, would have the following - positive and negative - consequences. Advantage: a traffic-free King William Walk and College Approach. council officials talk lyrically of creating new promenading areas along these streets, with their buildings (currently mostly residential) turned into new shops and restaurants. Advantage: some widening of pavements elsewhere. Notably along Greenwich High Road between the station and town centre. Disadvantage: traffic would increase substantially in the parts of the town centre that most pedestrians actually use. There would probably also be serious congestion on Greenwich Church Street - right in the heart of the town centre - as two lanes of eastbound traffic narrow down into one to pass along Nelson Road. Disadvantage: pedestrianisation is no panacea. Pedestrianised streets can be bleak, particularly at night. Pedestrianisation would probably lead to a rise in Greenwich's already growing problem of drunken anti-social behaviour. Disadvantage: bus services would be devastated. Assuming, as we probably should, that option 1 is a nonstarter, under option 2 more than100,000 bus passengers a day on all seven routes passing through Greenwich would suffer disruption. Many would suffer massive disruption. - The 199 (coming from Catford and Lewisham) would simply no longer be able to serve Greenwich town centre at all - the closest it could get would be the railway station. It would have to turn right from South Street into Greenwich High Road, then into Norman Road and then pick up its old route at Creek Road, skipping the centre. Alternatively, it would have to make a double loop of Greenwich, adding perhaps 20 minutes to the journey time. - The pedestrianisation would swallow up the current terminus for the 129 and 286. The people at the exhibition had no idea where these buses would turn round under the new scheme. They too might not be able to serve central Greenwich at all. - The 180 from Lewisham and 386 from Blackheath would be able to reach the town centre, but would have to make a huge detour via the station, Norman Road and Creek Road, adding at least another ten minutes to their journeys (probably far longer in the peak) and at least doubling the journey time from Lewisham to central Greenwich. If the 199 did not do a double loop, the frequency of service from Lewisham to central Greenwich would also be halved. - The eastbound 177 would have to make a similar lengthy detour and would no longer be able to serve the railway station. - The westbound 188 would also have to make a lengthy detour via Greenwich High Road and Norman Road. - There is currently a bus lane eastbound along Greenwich High Road which significantly speeds buses. However, there will be no bus lane along Norman Road, the proposed eastbound diversionary route, meaning even slower journeys for bus passengers. - There would be enormous confusion generally among passengers. Many passengers (particularly those travelling to Creek Road and Greenwich High Road) would be faced with longer walks to or from their nearest bus stops. However, this would, the council admits, result in "additional traffic congestion" because buses turning right at St Alfege Church and stopping on Nelson Road to pick up passengers would significantly slow down the traffic flow through the town centre, causing major jams. It would also preclude the pavement improvements. Disadvantage: traffic and pollution would be spread over a wider area. Even if the total number of vehicles does not change, most drivers coming from the east and south will have to use more roads and drive significantly further to pass through the area. This means more pollution for everyone, and more traffic for many. On Greenwich High Road, for instance, there may no longer be any eastbound traffic - but that will be more than made up for by a significant increase in the amount of westbound traffic. All the westbound traffic which currently uses Creek Road, as well as High Road's current westbound traffic, will have to pass along here. Norman Road will also see much more traffic. Residents of Roan Street, Randall Place, Straightsmouth and the Tarves Way/ Haddo Street estates will effectively find themselves in the middle of a giant roundabout. There will also be traffic jams in new places: for example, at either end of Norman Road. Disadvantage: many local journeys will become very long and convoluted. It will no longer be possible to approach Royal Hill or Stockwell Street/ Crooms Hill from the west - or leave them if you are going east. To reach these streets from central London, or leave them towards east Greenwich, you will have to go round via Norman Road, Creek Road and the town centre (getting caught in all the traffic congestion on the way.) It will become much more difficult to drive to Somerfield or the cinema. 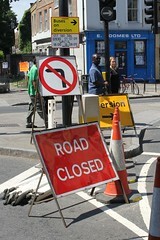 There is an option 2a allowing two-way movement on the High Road (as far as Stockwell Street) which would mitigate this. Rather than go all the way round via Greenwich High Road and Norman Road, many rush-hour drivers driving up through Greenwich Park would instead cut through the back streets of west Greenwich, such as Circus Street and Gloucester Circus. The proposals contain nothing to prevent this. The convoluted journeys for local residents will also lead to significantly more rat-running by locals. Disadvantage: more traffic through the Park and over the Heath. It is likely that rather than brave the new gyratory, some traffic will divert to the A2 - further increasing congestion on this route - or come through the park, perhaps rat-running through residential streets as before. Unsatisfactory as it is, the status quo remains the least worst option. The latest proposal seems yet another of the council's ill-thought-out Olympic-related schemes. Its benefits are modest and its drawbacks far greater. WHEN you're in an argument with someone, there are two clear signs that they're losing. The first is when they resort to abuse - and the second is when they have to distort your case to buttress their own. In their battle to knock down Greenwich Market, Nick Raynsford MP, the Greenwich Society and the forces of development did both those things - and did, indeed, lose. So it's rather encouraging to see them reprising exactly the same tactics over the Greenwich Park Olympics. In an article for this website last week, Mr Raynsford accused Nogoe, the anti-Olympics group, of "scaremongering" and a "complete misrepresentation of the facts." His evidence? A poster they issued, with a picture of the open area in front of the National Maritime Museum, and beneath it the statement that "this will be a no go area in 2012 for several months." It is actually Mr Raynsford who is distorting the facts here. As last week's planning application confirms, the area depicted in Nogoe's poster will indeed be closed - for eight months. Mr Raynsford attacks Nogoe for "continuing to perpetuate the myth that the park would be closed in a BBC report in October this year, when a spokeswoman said it would be 'socially and morally wrong' for the park to be closed, despite knowing that this would not be the case." The actual BBC report quotes Nogoe's spokeswoman as saying that it would be socially and morally wrong to close the park during the games. And as last week's planning application confirms, it will indeed be closed during the games. The outline facts of the Park's closure are actually quite uncontested. They have been established everywhere outside the mind of Nick Raynsford for more than a year now. And what the further details published last week show is that, far from "scaremongering," Nogoe have significantly understated the problems the Olympics will cause. Forty-two thousand vehicle movements in the park, including more than 6,000 lorry movements; five years of works, starting next spring; the park sliced up with fences for most if not all of that time; full restoration of the park only in 2015. And the more I pore through the planning documents, the more horrors emerge - details to follow. What other distortions have the pro-Games forces been guilty of? Mr Raynsford describes one survey showing an improbable 85% support for the Games as "independent polling." Actually, it was a voodoo poll. It was market research, not done to the standards of a professional opinion pollster. It was carried out for Locog, and it was packed with questions so comically loaded that 85% must in fact have been a very disappointing result. Locog, in another of last week's ripostes, claimed that "all work related to the Games will be completed by November 2012," other than the acid grass restoration programme by 2015. Not true: the "amenity grassland" across much of the park will be fenced off until spring 2013. They also say that the extent of tree pruning will be "minimal" and "routine." I think the trees which will suffer a "removal of branches to the main stem" might quarrel with that. In this debate and others Nick Raynsford, in particular, is in danger of becoming ridiculous. Not long ago, he was quoted as saying that he had "no doubt" that the redevelopment of Greenwich Market would succeed on appeal and would be built. The proposal was in breach of so many council and Government planning policies, and its rejection by councillors was so comprehensive, that it in fact seems rather unlikely to win an appeal, or to be built in its current form. Economics have also turned against the development. At the same meeting that councillors refused the market redevelopment, centred around a huge new hotel, they approved a large new hotel on Greenwich High Road. They're also currently considering another hotel proposal - the conversion of the upper floors of the Trafalgar pub. So any new hotel in the market now faces even greater challenges to its commercial viability. Mr Raynsford's instinct for distortion was also on hand over the market, with a claim that opponents had said Turnpin Lane would be destroyed. Nobody had said anything of the sort, of course. In psychoanalysis, this sort of behaviour is known as "Freudian projection" - when you project on to others the faults and flaws you sense in yourself. Mr Raynsford may be able to inhabit his own private fantasy world for the majority of the parliamentary term. But with no more than six months before he must face his voters, it seems a rather unwise place for him to be at the moment. GREENWICH Park will not be fully restored to its current state after the Olympics until 2015, the planning application documents, published on the council's website on Tuesday, show. Areas of the park will be closed off from February or March 2010, meaning that the park has less than four months of full public access left. The total duration of the Olympic-related works and closures in the Park will be five years. The total duration of the events themselves is two weeks. (it is about three-quarters of the way down the list of documents). References which follow are to ES paragraph numbers, except where indicated. Construction and removal of the main 23,00-seat showjumping arena will create an estimated 6,420 lorry movements to the park - an average of 43 to 58 per day . (ES 3.4.17). This phase will close large parts of the park for a total of eight months in 2012, from April to November inclusive (ES 3.2). Other items of plant in the park will include 160-tonne mobile cranes, 5 tonne mini-excavators, bulldozers and JCBs (ES 3.4.23). The events themselves will create 35,960 vehicle movements by competitors, officials and media to the park, an average of 625 a day. (ES 3.4.32). The park will be almost completely closed for four weeks (ES 3.3.7) and largely closed for longer. The overall permanent impact on the park's heritage features is assessed as "likely to be neutral to slightly adverse" and the ES admits that some heritage features could suffer permanent "loss or partial loss." (ES introduction, page 10). Most features, it is claimed, will be protected by mitigation (protective structures and the like). But "as a last resort," some heritage features will be "preserv[ed] by record," ie permanently destroyed, but only after pictures and records have been made of them. (ES introduction, page 10). A set of ornate gates into the park will be removed to allow vehicle access, although it is promised that they will be replaced afterwards. although a number would be up to but not more than 50mm. (ES 12.6.9). There will be temporary power plants, water and fuel tank compounds (ES 3.2.52-5). Temprary ducts will be dug across the park to divert some existing gas, water and sewage mains pipes which currently pass under areas needed for the competition (ES 3.2.61). The closures are contained in the "indicative programme" on pages 27-30 of the ES (the pages are confusingly numbered in a separate sequence from the introduction.) They show that there will be two and a half years of "advance grass management works" from spring 2010 to summer 2012 to "create a safe riding surface" along the cross-country course. The acid grassland in the park would need until 2015 to recover and would probably be fenced off during that time. The amenity grassland would be fenced off until spring 2013. (ES pages 27-30). The figure seems rather implausible because it is actually higher than the same survey's figure for the number of Greenwich residents (81%) who support the Games happening in London at all. Nor is the 81% figure at all consistent with the latest opinion poll, for the Evening Standard, which shows support for the Olympics running at less than 60% of Londoners as a whole. Close examination of the methodology of the survey reveals how the figures were rigged. The key question people were asked was a leading one. The exact question is not quoted, but according to the report of the survey, in Appendix 18 of this document, [http://www.london2012.com/greenwich-park/documents/report-on-community-engagement/locog-report-on-community-engagement-v19-with-apps-1-.pdf ] it was along the lines of "Are you in favour of Greenwich Park hosting the games, provided that the whole park will be closed for a period of up to six weeks, no permanent damage will be done and considering the economic and social benefits?" This question is not just leading - against the rules of all professional opinion pollsters - but is actually misleading, since it is far from clear that there will be any economic and social benefits from this particular aspect of the Olympics. Not content with that, however, participants in the survey were softened up first. Before being asked the key question, they were asked to agree or disagree with a series of preliminary statements designed to get them in a favourable frame of mind, such as: "The Royal Parks does a good job at protecting and managing Greenwich Park," "I believe that the Royal Parks will ensure that Greenwich Park will be returned to perfect condition with no permanent damage after the Games," and "I don't think that the Royal Parks would allow any event to take place that would cause lasting damage to the Park." No doubt the 85% figure will be much quoted in the weeks ahead. But it is of a level of manipulation to make Kim il-Sung blush. More details to follow after I've had a chance to read through the whole 1800-odd pages. 200 more buildings to be locally listed – is your house one of them? APOLOGIES for delaying last week's column until this week - I have been waiting, so far in vain, for news of the Olympics planning application (promised by "late November" - only one day left, guys!) and the closure of the foot tunnel (supposed to be discussed by the council's cabinet on 17 November - but the meeting was cancelled). I'll post a new column as soon as I have anything concrete to tell you on either subject - probably later this week - but while we wait, let's talk conservation areas. There are six in SE10 and the Greenwich borough parts of SE3 - and the council has been reviewing five of them: West Greenwich, Greenwich Park, East Greenwich, Blackheath and Blackheath Park. The sixth, Ashburnham Triangle, was done last year but I will include that too, for completeness. The reviews also consider whether any more buildings should be listed or locally listed. - Listing about 25 buildings, all in Ashburnham Triangle; see below for the full list. - Locally listing about 200 buildings, including the Greenwich Power Station, the Pavilion tea-house in the Park and most of the Span estates in Blackheath. See below for the full list. - In West Greenwich, reducing the boundaries of the conservation area to take out flats "of no special merit" around Dutton Street and Winforton Street. Adding two Victorian schools, St Alfege with St Peters (in Creek Road) and James Wolfe (Randall Place). Possibly adding the cabaret club in Creek Road. - In East Greenwich, extending the conservation area to include the whole of Trafalgar Road from Christ Church to the Royal Naval College, including all of Old Woolwich Road. All buildings in conservation areas are subject to extra planning controls - on, for instance, the placement of satellite dishes and the size of extensions allowed, fences, walls and railings. West Greenwich, East Greenwich and the Ashburnham Triangle (though not the other three) are "Article 4" conservation areas with enhanced protection where nearly all external alterations, including re-roofing and new windows and doors, need planning permission. Listed buildings have statutory protection - that is, it is a criminal offence to change them (inside or out) without special listed building consent. Locally listed buildings have no special extra protection - they are just buildings the council thinks are nice. Having your house on the local list might increase its value, though. Plus most of the Span estates in Blackheath Park, including The Plantation, Corner Green, The Keep, The Lane and The Hall except 1-27 Foxes Dale and 51-63 The Hall. It's also nice to see how the Greenwich Park conservation area appraisal waxes lyrical about the park's "sense of continuity and timelessness" that "acts as an oasis for visitors... hugely significant for historical, cultural and ecological reasons." The Olympics'll soon put a stop to all that nonsense, eh! THEY called it the "chicken run." In the mid-1990s, as general election defeat loomed, top Tories started abandoning their parliamentary seats and getting themselves safer ones. Among them was this borough's very own Peter Bottomley, Tory MP for Eltham until he decided he was more likely to keep his job by moving to the rather less marginal territory of West Worthing. It was seen as a clear signal of the Tories conceding defeat. Labour, both nationally and locally, had a lot of fun at the "chickens'" expense: Frank Dobson, the shadow environment secretary, launched what he called "Operation Chicken Watch," chortling: "The Government says the feelgood factor will win them the election, but Tory MPs don't feel good." What goes around, comes around. Labour MPs aren't allowed to do what their Tory counterparts did in the 1990s - but there's no such rule for Labour councillors. And ahead of the local elections next May, Greenwich, once again, is at the centre of something that looks rather like a chicken run. Peninsula ward is essentially East Greenwich and GMV - everything in SE10 east of the Naval College and north of the railway line, plus a little bit of Charlton. It's a more socially mixed, middle-class place than Glyndon, which sits between Woolwich and Plumstead town centres. Peninsula will also be heavily affected by the unpopular plans to close the park and roads for the Olympics - could that be a factor in Roberts' decision? I couldn't ask either councillor why they are moving - they haven't returned my calls - but Spencer Drury, the Tory opposition leader, says: "I think it does show they're worried, and I think they're right to be worried. I think the council have called a number of issues wrong - for instance, they've made the judgment that they want to organise cuts immediately after the elections and not tell people about them before. The response we're getting on the doorstep is excellent." Mr Roberts' move is particularly interesting, not just because he is council leader but because his current berth, Peninsula, was not seen as a particularly marginal ward. Seven wards with Labour councillors - including four wards where the party holds all three of the council seats - registered a lower Labour share of the vote than Peninsula did. If Labour lost all those wards, even if it kept Peninsula, it would lose control of the council. Does that mean Labour is in with a serious chance of defeat? I'm not sure; much depends on whether the opposition in each ward coalesces around one party, or whether it is split between two or three. With the 2006 elections delivering them 36 out of the 51 seats, Greenwich remains one of Labour's safest councils in London. But Labour got a very bad fright here in last year's mayoral elections. For the first time in decades, if not in living memory, the Tories won more votes than Labour across the borough of Greenwich. In the current political climate, and with a Westminster election likely to take place on the same day as the local poll, no Labour council can be considered entirely safe. Mr Roberts certainly isn't taking any chances. p.s. Michael Stanworth, the Labour Borough Organiser for Greenwich, has been in touch to say "I can assure you that there is nothing sinister about his move to Glyndon ward, it is just closer to where he lives." GREENWICH Council is planning "significant" cuts of at least £26.8 million - and possibly "over £30m," according to confidential council documents leaked to greenwich.co.uk. "restrict[ing] access to [council] services;"
the scrapping of "services, activities or projects which are low priority." withdrawal from collective bodies such as London Councils and the Local Government Association. The plans are contained in a confidential document written by the council's chief executive, Mary Ney, leaked to this website and downloadable here (PDF file, 612kb). The document was discussed at a private meeting of the ruling Labour group on October 12, where Labour members talked about the council's new "medium term financial strategy," to take effect from April 2011. The minutes say: "It is known that the financial climate in this next period will be particularly challenging...It is expected that funding will be restricted and the Council will need to make significant reductions in its expenditure. Current best estimates are [of]... a reduction in revenue budgets of £26.8 million over the four-year period of the next administration." The minutes say: "Whilst every effort should be made to deliver these spending reductions through efficiencies, the scale of the task may mean that more difficult choices will be needed in relation to continuation of services." Council officers will, says the document, "identify a number of cost-cutting workstreams, reporting back to members as work is progressed." A total of 19 cost-cutting workstreams are identified. Among the most controversial options is workstream 4, which says that "proposals [will] be brought forward for the delivery of services via social enterprise models." Among the services listed as suitable for this is "health and social care." Workstream 6 is about grants to the voluntary sector and says: "As a minimum, this is likely to require cash-limited and possibly reduced budgets." Workstream 10 is to "scrutinise all Council activity to identify those services, activities or projects which are low priority and could cease." Workstream 12 is entitled "restricted access to services" and will "examine options to reduce demand and volume." There are also plans for "workforce efficiences," with a review of "terms and conditions," and for a "review of the charging strategy." However, one area protected from cuts is the Olympics, on which the council plans to spend at least £10 million. Cllr Spencer Drury, leader of the Conservative opposition, said: "Labour have a hidden programme of cuts in place and are refusing to be open about their plans. Greenwich Council's incompetence and inefficiency is what leads them to have to make these dramatic cuts. They have already wasted £27 million because they are three years late on their new school building programme. There are lots of ways they could have saved money by running themselves differently." Cllr Chris Roberts, the council leader, declined to comment when approached by greenwich.co.uk tonight. However, at the last full council meeting, on 28 October - sixteen days after the Labour group discussed making cuts - Cllr Roberts said: "The issue of cuts has not materialised." However, he added: "When the financial strategy is developed, it will obviously be brought to the council to be voted on." WHO SAID the British worker was lazy? Over the last few weeks, an impressive array of Men In Hard Hats have dug up what feels like every single street in West Greenwich, one at a time. No road appears too insignificant to be turned into a trench. And rather like the Jehovah’s Witnesses with new converts, no road completed is seen as simply an achievement in itself – but more as a God-given opportunity to dig up the next one. But why are they actually doing this? Is it some sort of Doris Salcedo-style art installation? Is it MI6, still looking for those missing Iraqi WMDs, following “compelling intelligence” that Saddam Hussein secretly buried them beneath Ashburnham Grove? Nobody seems to be displaying anything as boring as a sign telling us, so on your behalf, I have tried to find out. First stop is Greenwich Council’s exciting, interactive new streetworks database, recently launched to tell you everything you need to know about the hole-makers. This informs us that across the borough, there are currently 308 sets of roadworks – one for every five streets. In Greenwich itself, there are currently 77 sets of roadworks (77!) of which 9 are defined as “high impact.” Some of these (like the ones that recently caused such trouble in the town centre) are the work of Southern Gas Networks, doing gas main replacement. But from the database, it looks like the people who have been digging up most of our side streets are… Greenwich Council. The other possibility, of course, is that Greenwich Council does not itself know why it is digging up our roads. This is not as implausible as it sounds. After all, so many of the council’s other actions (closure of the foot tunnel, Olympics in the park) seem to have been taken on the same basis. What’s undeniable is that the current system for roadworks stinks. Setting aside the council, there are a large number of “statutory undertakers” – mostly water, gas, electricity and telecoms companies – who dig the majority of the holes in London’s endlessly-patched streets. Contrary to popular belief, these companies do not have to get approval from anyone – least of all the local authority – to start work. With only a few exceptions, they have the right to dig up the roads whenever they want. 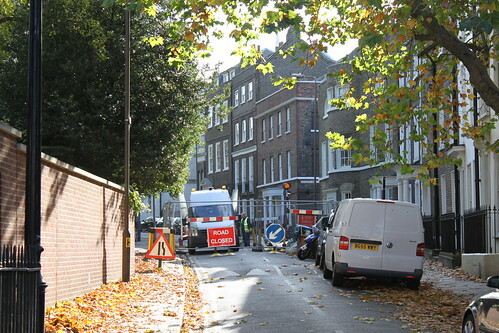 They just have to give notice, and sometimes not even that in the case of work deemed “urgent” or “emergency.” There is little or nothing to stop different statutory undertakers – or even the same one – digging up the same street as soon as a previous dig has finished. In July 2004, the Government passed the Traffic Management Act – which allowed local authorities to introduce “permit schemes” to regulate and co-ordinate roadworks. However, thanks to heavy lobbying from the utility companies, Whitehall for more than five years refused to allow local authorities to use the powers they had themselves granted. Only last month was the first permit scheme under the Act – for TfL and 18 London boroughs - finally approved by ministers. More sensible regulation of roadworks will probably be implemented only next year, a full six years after the legislation was passed. There’s one other unfortunate fact, I’m afraid. Our borough is not among the 18 included the permit scheme (although Lewisham is, for the benefit of our more southerly readers.) Greenwich is in fact in the last wave of London councils on this issue, having not yet made up its mind when it wants a permit scheme at all. Whether through carrying out its own mystery roadworks, or failing to regulate other people’s, Greenwich will continue to be the borough with too many holes in the road for some time to come. LONDON 2012 has backed away from a pledge it made only last month over the total closure of Greenwich Park for the controversial Olympic equestrian events. However, material produced for this week’s public consultation in Greenwich shows that this “clear commitment” has already been abandoned. As well as the total closure in summer 2012, large parts of the Park will be closed for most of the rest of the year to allow a 23,000-seat showjumping arena, ancillary buildings and stabling for 200 horses to be erected and dismantled. It had been believed that these closures, beginning in April 2012, would be lifted in October. However, a presentation published on the Locog site shows that closures are now expected to continue until at least November. The same presentation also shows that the Park’s closure in 2011 for the pre-Olympic test event will be far greater than previously expected. The closure will seal off almost half the park for three weeks in June and July 2011. Almost everything which lies east of the road running through the park – except the children’s playground, the flower garden and a small area around the Observatory – will be closed. Locog’s press release also said that “there are no planned residential road closures.” However, the presentation shows that three residential roads, Park Vista, Maze Hill and Shooters Hill Road, are designated as “core Olympic Route Network” roads, which will carry the vast majority of traffic to the Park. It seems unlikely that these will not be closed. The presentation says spectators for the arena will enter the Park through the grounds of the Royal Naval College and pass through security on the front lawn of the National Maritime Museum. This means that 23,000 people will have to cross, or queue up on, Romney Road – thus almost certainly requiring its closure, too, during the Games. Charlton Way, the main road immediately to the south of the Park, will also be closed and a “vehicle screening point” will be set up at the junction with Maze Hill. The material also includes the first plan for the cross-country course which has not been labelled “indicative.” This shows that the course will cross directly through an avenue of the Park’s most precious trees, sweet chestnuts planted in the reign of Charles II, which are among the oldest living things in London. I don’t know about you, but I’m looking forward to it more than ever!